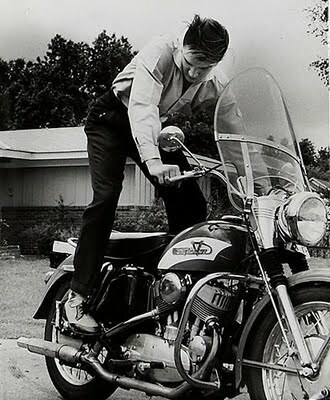 Yes - that's Elvis kick starting a Harley Davidson. I see variations of a quote usually attributed to Woody Allen, that states "90% of success is showing up". While one can quibble with the percentage or even the attribution to Woody Allen, there's still a lot to be said for just showing up! DO something! Get off dead center! If you find yourself procrastinating about starting the book you know you should write, you may need to just jump in and DO something! Anything! Here are some suggestions to kick start your writing. Many people find it less intimidating to simply begin writing short blog entries, which then "prime the pump" of more sustained writing. Some people even turn the blog itself into a book. Sometimes it's helpful to begin doing more research into your topic. As you uncover information, keep a file, and evaluate it against what you already know. Challenge assumptions. Get yourself fired up about bringing new insight into the topic. Maybe a spreadsheet will help you organize your unique viewpoints. 3. Work with a book developer. If you're serious about pushing through the touchpoints of putting a book together, you may need an outside consultant to help you set and meet deadlines, keep you on track, be your cheerleader and lend some experienced perspective to your efforts. While it may sound overly simple to suggest setting a schedule, it's actually quite effective, and easily overlooked. Think in terms of 'next step' instead of 'finish date'. It's really a project management issue, so breaking down the process into steps, and then executing the steps can help you measure your progress. Let people read what you've written and then listen to their candid questions and comments. If you haven't written anything yet, at least put together an outline of what you plan to write. Look for holes in the material and plug 'em up! Yes - that's what 'showing up' is for a writer. Write something. Anything. Write character sketches, write plot outlines, write descriptions. Just start writing. If you have something to say, and some decent writing skills, you must start. You will not finish if you don't begin. Any tool you would use to apply some discipline to other areas of your life may be exactly what you need to apply to THIS part of your life. Think about how you go about accomplishing other goals. Chances are you already have some good motivators in your "like kit", so use them. I am always available to discuss your project. Call me at 214-725-2823.